To be completely honest, I started cutting Mark's hair because I went with him to his hair appointment and didn't like seeing strange women running their fingers through his hair. Unfortunately, short-haired folks like Mark need their hair cut every couple of weeks or they start looking shaggy. But a trip to the big city every two weeks to shell out $20 and watch that jealously guarded head become public property was too much for me to bear. 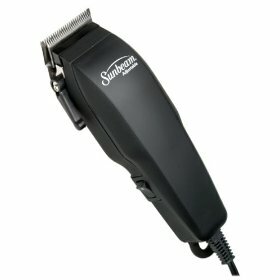 So, instead, I trotted down to Rite-Aid and bought an electric razor like this one for less than the cost of one haircut. It comes with attachments which cut hair at several different lengths, making it pretty simple to keep Mark looking movie-star perfect on the farm. (Just be sure to keep the blade oiled.) I figure we've seen about a 2,000% return on our investment so far --- pretty good! My fella has been cutting his own hair since before we married almost 9 years ago. Yes, his OWN! His sister is a hairdresser and complimented me recently on my wonderful blending skills. She was amazed that he does it all himself. His impetus was a terrible "professional" cut that he had to come home and fix himself before going out one evening. He figured there was no way he could make it look worse than that person had. I keep our boys nicely coiffed but he takes care of himself. So nice! And I think we've been using the same clippers for a decade- this may be the second set. We have another one (bought during an away-from-home emergency) that we keep in storage against the day that this set bites the dust. I'm amazed sometimes by how persnickity men can be about their hair! (Mark's that way too, but don't tell him I told you. ) I'm surprised that more people don't follow your lead and buy a set of clippers.